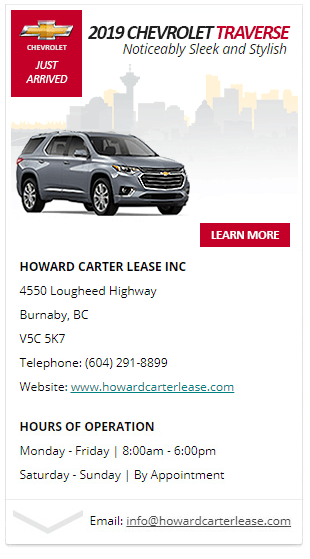 Howard Carter Lease | Is vehicle leasing right for you? We strive to get our customer’s into the right vehicle… at the right time! At Howard Carter Lease Ltd we provide our customer’s with the ‘Right Lease’ – with plently of options and flexibility. And, with a our lease services, our customer’s are never constrained by overall price of the vehicle as they would be when buying, because they only pay for what they use. Let Howard Carter Lease Ltd provide ‘peace of mind’ from wear-and-tear charges with XS Wear lease protection. Improve Cash Flow – the greatest benefit of leasing is improved cash flow. With no down payment and lower monthly payments, the retention of cash in business or personal finances are improved. Lower Monthly Payments – because you only pay for the lease terms of the vehicle that you use, your monthly payments are lower than if you purchase the vehicle. Tax Advantages – there can be some tax advantages for businesses to leasing. In certain circumstances, leasing may yield a more favorable tax result than a purchase. We suggest you seek advice from your tax professional to determine whats best for you. There are also sales tax benefits to leasing. When you purchase a vehicle, sales tax is due immediately. However when you lease, sales tax is only payable on your capital cost reduction (down payment), and on the monthly payments. More Vehicle For Your Money – because you’re only paying for the lease term of the vehicle you use, and because your monthly payments are lower, you maybe able to afford a lease a more equipped vehicle than you could purchase. New Vehicle More Often – because of lower monthly payments and defined lease periods, you can get into a new vehicles more often. Manufacturers Warranties – many lease periods parallel the time frames for manufacturers warranties, allowing you to have warranty coverage for as long as you drive the vehicle. Howard Carter Lease is a flexible leasing company. By carefully reviewing all options, we can analyze our customer’s specific needs and provide practical, insightful recommendations and solutions. Based on this information, we can design a lease to your individual or fleet.